Only the right products will give your customers the right solution. Digital Signage is suitable for a large range of customers, businesses, corporations, government, education and many other types. The solutions available today are wide and varied and provide customers with a new method of successfully communicating with their staff or their customers. Command's products have been carefully selected to give customers the edge in technology and reliability. Below are just a few of the customer types successfully using Command's digital signage products. FIDS, Retail, Customs, Information displays. Display TV, news tickers, menu items and advertising to your customers. Candy Bar, Session Times, Movie Previews. Wayfinding, information, directional signage and event information. Foyer displays, customer information, internal communications, corporate communications and wayfinding. Student, staff, parent and visitor information displays. 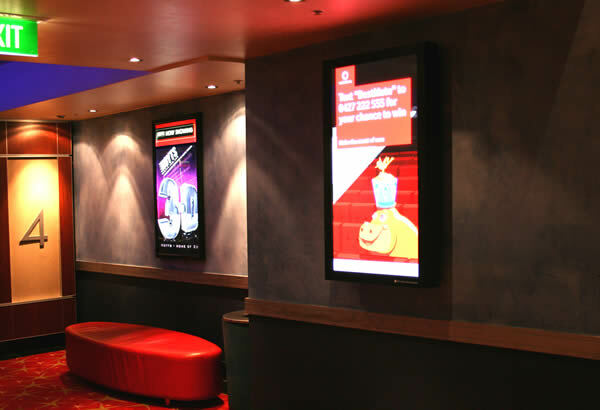 Centrally managed advertising, promotional, menu boards and display screens. Staff Information, customer displays, digital information boards and more. Event information, wayfinding, foyer displays, weather, time and airport information, promotional displays. Easy to install, easy to use. From the most basic systems to fully managed solutions suitable for integrator installation. Display consistent information to all employees. Production system information, warning displays, security and safety message plus internal communications. Internal Communications, safety messaging, camps, cribs, production for internal and external use. POS, advertising, promotions, centrally managed for small to large installations. Digital menu boards, customer promotions, advertising displays. Production displays, promotional screens, demonstration displays. Corporate boxes, wayfinding, restaurant signage, directional displays, large scale LED displays.